Do you have a place where you can get away and completely clear your head? For me, it’s the ocean. I’ve been in desperate need of some beach for weeks now. I had a last minute opportunity to join a friend for a super early morning surf trip, and I could NOT resist. Note: these pictures are from two summers ago. I brought a disposable waterproof camera today, because I didn’t want to ruin my good camera. I’ll have to wait a bit before I get those pictures back! 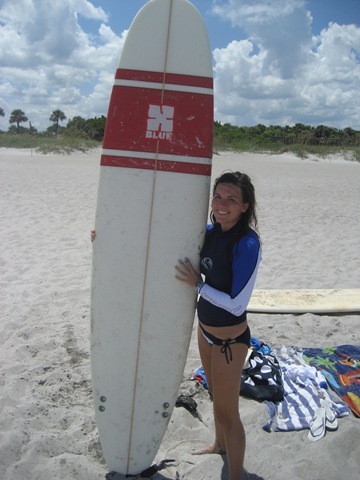 I bought my board two summers ago, after surfing on my friends’ boards for about a year. …but it has been sitting in the corner of my living room for far too long. 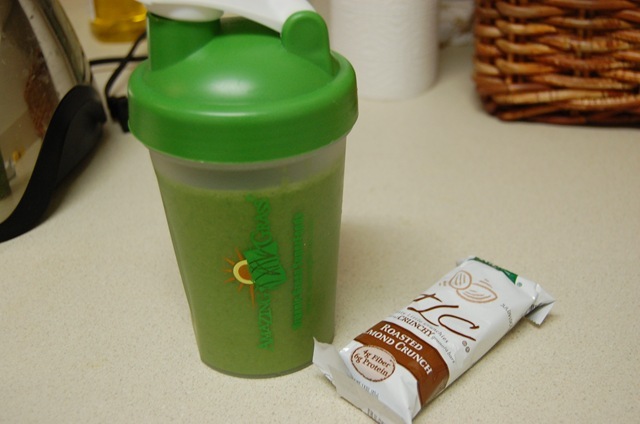 Before I left for the beach, I made a quick green smoothie and grabbed a Kashi granola bar. Bananas are supposed to be good for being in the sun (according to my surf buddies) but I didn’t have any fresh, so I did the next best thing… took a frozen one out and whipped up a smoothie! When I got to the beach this morning, just after 7:00am. There were only a few other people at the beach, and a handful in the ocean. The sun was already risen over the low tide, and the waves were rolling. Looking out onto the ocean, I felt like my day was a blank canvas, waiting for me to dive in and paint it how I see fit. It was an amazing feeling. With every paddle out, I was fighting the waves. Normally, the sets roll in with about 30 seconds of break in between. This morning, I was getting smacked in the face by waist high waves (the pictures are about ankle/shin high) with no relief from a set break. It was tough, but refreshing all at the same time… if that makes any sense? In all honesty, I am actually really scared of the ocean. I have no clue how I manage to swim hundreds of yards out to surf. The critters, the rip current, the potential sharks, algae, seaweed getting wrapped around my ankles. It all just seems so disgusting and dangerous. 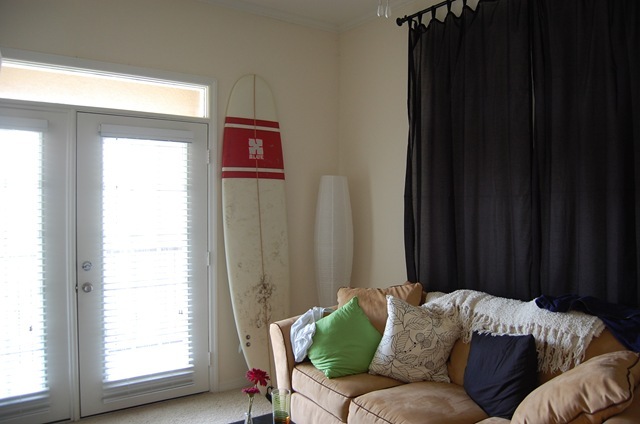 I usually stop and stare out at the water, surfboard under my arm, for a good 15 minutes or longer before entering. Something about the power of ocean demands respect, and I am so drawn to it. It’s kind of like a looking fear in the face thing. 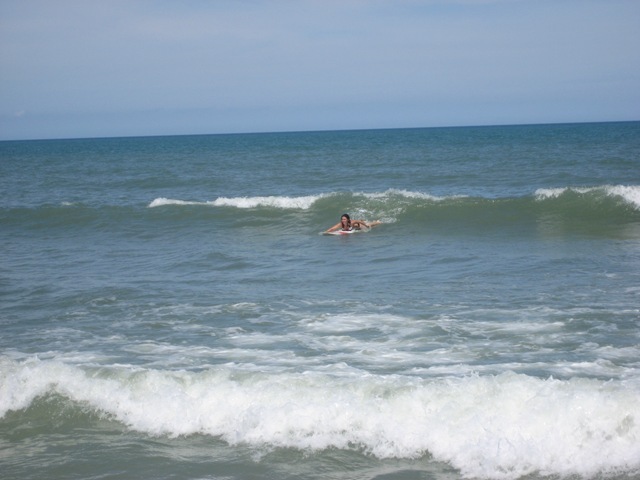 After an hour of fighting waves, I started getting pretty tired and headed back to the beach. I did notice that paddling was MUCH easier since I’ve been swimming. Perhaps surfing could be a new form of cross-training? I sat on the beach and did a few yoga type moves while I waited for my surf buddy to catch a few more waves. We left the beach by 10:00am or so, trying not to be complete and utter slackers. I was tired of being in the sun, and still had to get to school and get some other work done. People don’t get it. I don’t really care. I came back feeling completely refreshed.